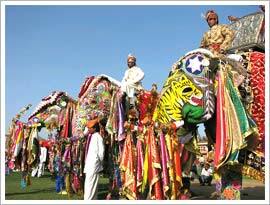 Organised by Rajasthan Tourism board, the Elephant Festival adds more color to the already colorful festival of Holi. It is celebrated on the eve of Holi. The festival is dedicated to the giant creature elephant. In the bygone era, elephant was the royal vehicle of the Maharajas. They were also used in battles. But in this festival the role of elephant has completely taken a whole new meaning. Here they are the proud participants of several cultural activities high on entertainment quotient. People of Rajasthan celebrate it with great pomp and show. Chaugan, the vast ground serves as the venue for Elephant Festival. The beautifully painted and adorned elephants march in the ground attracting spectators’ attention. The show really takes you back to the glorious historic days of royals. Just imagine elephants running races with all their might in order to bag the first prize. Think about participants mounted on elephants playing the royal game polo. Sound very interesting! The majestic animal even participates in a beauty pageant organised to select the most beautiful female elephant. The mahouts of the participating female elephants spend hours to adorn them. They are painted with different colors, decorated with fine jewellery and covered with beautiful velvets. Do not miss the beauty pageant and keep guessing 'who will be the winner'. Mount these bejewelled elephants and play Holi (an important festival of India) in an entirely different style. Surely, you will never forget such a wonderful experience.